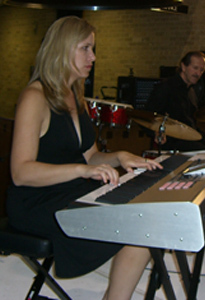 In 2003, a passion for expressing the soul through jazz brought this group of musicians together in Plano, Texas. We come from different walks of life to blend our talents and love of music into a stream of jazz energy that we call WhoNew. The name hints at the pleasant surprise we experienced to find that such an eclectic group could have so much fun making good music! 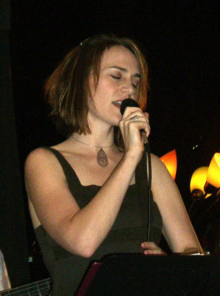 Long after playing clarinet and saxophone in high school and college, Dana picked up the horn again in 1991, proving that its never too late to make music. Through 1993 he played with the Brookhaven College Jazz Band in Dallas, under the direction of Grammy-nominated arranger Mike Bogle, and seated next to child prodigy Norah Jones. Dana later spent some time backing the Blues Drifters, a blues band with lots of guitars. He also played sax in the EDS Jazz Ensemble, a big band format. In 2003, he wanted to play more ensemble jazz and convinced vocalist Jill Whitson Kurtz to join him as the nucleus of a laid-back jazz sextet... WhoNew? George began playing piano at the age of 5 and later added drums as a second instrument. 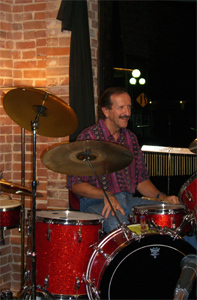 As a young musician, he was a classical percussionist with the St. Louis Philharmonic Orchestra, and he played various venues with the Herb Drury Jazz Trio, The Velvetones, and The Cautions. Being young and restless, George declined a music scholarship to pursue the fast lane and spent the next two years on the road playing blue-eyed soul, rock, and R&Bhe even claims to remember part of this. He was the studio musician for the now defunct Hi record label before leaving the music scene to pursue an education and a career. Now, many years later, George has rekindled his interest in playing drums with WhoNew. Gordon discovered bass in 1968 and began picking out bass lines from the Byrds, Cream, and other rock groups on his uncle’s $25 Silvertone acoustic guitar. Gordon got his first bass in 1969 - a Univox Gibson EB2 copy. High school stage band and pep band were his first "gigs". Along with a college buddy, they formed an eight piece "Chicago" horn band in college and he also played bass in the college jazz big band. He sold the Univox bass in 1975 (a mistake he says) and didn’t take it up again until 1986 when he picked up a used Fender Precision Bass and started playing tunes again. He has played in two blues/swing combos since moving from St. Louis to Dallas in 1994. Gordon developed an interest in jazz several years ago and attends a week long jazz camp every July at Collin County Community College He also plays in a jazz combo at the school where he has become a perpetual student. 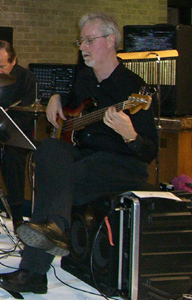 Gordon has been fortunate to study with some of the top jazz talent and educators in the DFW area including Kris Berg (bass), John Adams (bass), Kevin McNerney (sax), Kent Ellingson (piano), Tom Burchill (guitar), and Mike Drake (drums). As a true worlds citizen (Asian descent, born and	raised in Brazil, and Texas resident), Paulo says one of his main goals is to be a diversity ambassador through his music. In fact, his playing is a result of a wide palette of musical and cultural influences ranging from samba to jazz, sushi to Texas BBQ. 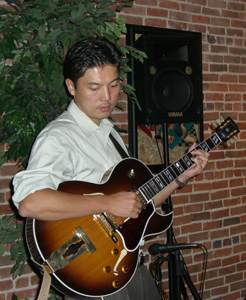 Paulo taught himself how to play the guitar, and after settling down in Dallas, he has supplemented his musical education by playing with the North Lake Community College big band as well as participating in master classes with jazz guitar greats such as Jack Petersen, Bucky	Pizzarelli, Clint Strong, Mark Tonelli, etc. When Paulo is not playing the guitar, he spends most of his time building financial models for a major corporation in the DFW area and day dreaming about jamming with	Kenny Burrell, Grant Green, or Joe Pass. Paulo has been with WhoNew since March 20042005 and has greatly enjoyed the trip ever since.